No longer a Ring virgin, I am now a fully qualified Lord of the Ring after sitting through all 19 or so hours of the Met’s epic, and somewhat controversial, new Ring Cycle. Cutting edge director Robert Lepage has divided audiences with his high-tech staging, with detractors lamenting the lack of direction of the human performers. The massive machinery of the setting, designed by Carl Fillion with video images by Boris Firquet, is certainly mightily impressive, but does it serve the story? 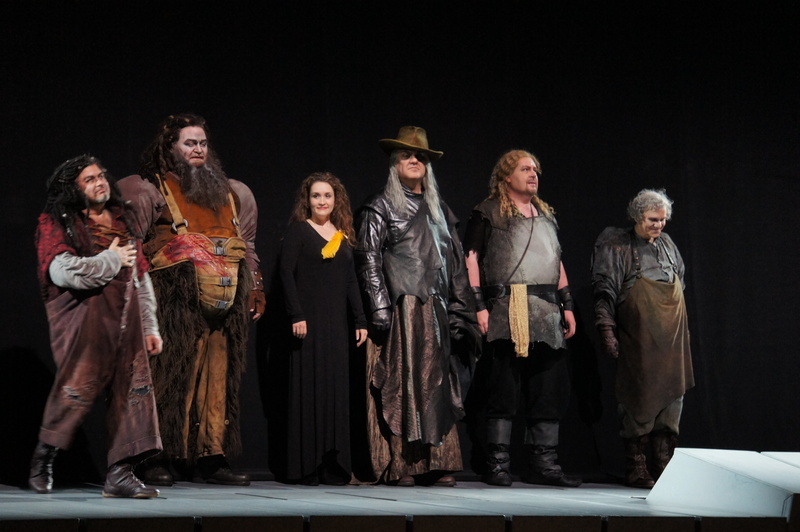 Not a connoisseur of Wagner’s music for The Ring by any measure, I have focused on describing the connection between scenery and story, with some comment on the world-class performers assembled to take on these most challenging of roles. 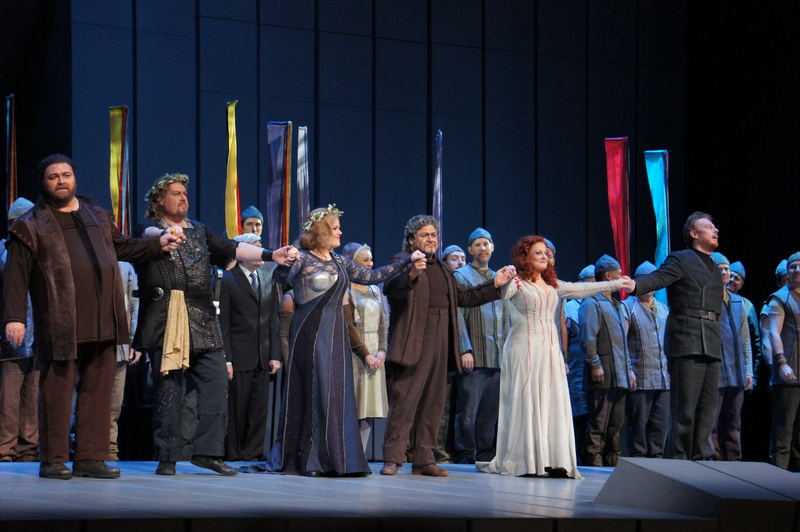 The reviews are based on the third Ring Cycle in May 2012. 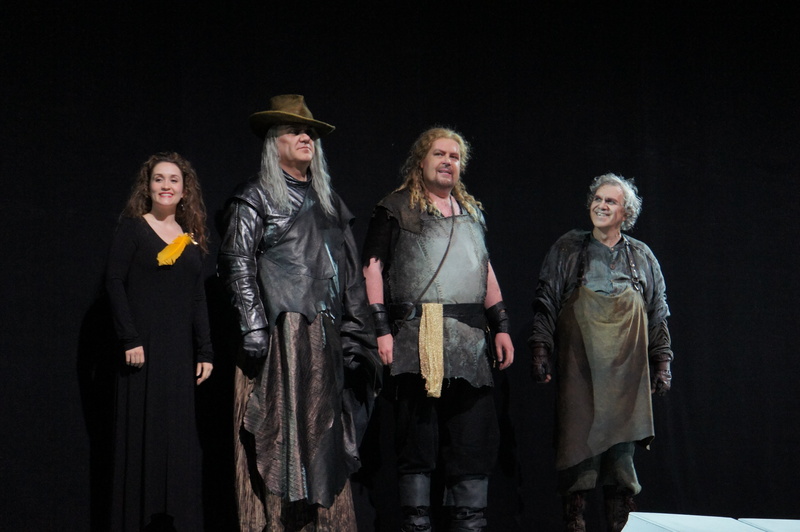 The shortest of the four operas, at a skimpy two and a half hours, Das Rheingold still stretches audience endurance by the fact there is no interval! More than that, there is not even any place to clap in those two and a half hours. Fortunately, there is a good variety of settings and some entertaining scenes involving large numbers of principal singers. The prelude sees the scenery (“The Machine”) waken as instruments join the growing chord and then undulate in waves in accompaniment to the pulsing arpeggios. The beams of the machine turn over, lifting the Rhinemaidens into view. Erin Morley, Jennifer Johnson Cano and Tamara Mumford are incredibly courageous to be suspended high above the stage, not to mention in possession of strong diaphragms given their beautiful singing while in harnesses. Early effects demonstrate the advanced projections in use. Bubbles float above each Rhinemaiden in reaction to the strength of their singing. Sand and pebbles of the river bed cascade wherever the maidens, and the dwarf Alberich, put pressure. Once Alberich has been rebuffed by each Rhinemaiden and has made off with their gold, we are high on the mountain of the Gods. 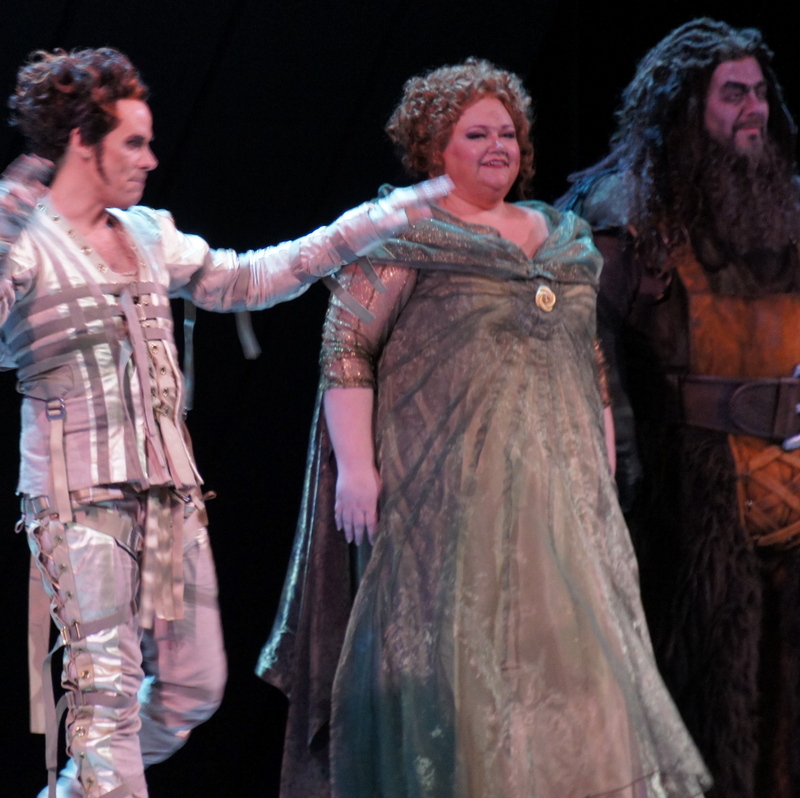 An incredibly strong pair sing the roles of Wotan and his wife Fricka. Stephanie Blythe, a vision in floating pale green chiffon, is a commanding presence and a singer of great power and beauty. Bryan Terfel, in a performance as epic as the opera cycle itself, is magnificent, giving of himself fully in a masterful, totally committed performance. Another clever effect is seen with the arrival of Loge, demigod of fire, sung superbly by American tenor Adam Klein: a flaming apparition is seen wherever Klein stands on the set. One of the most striking images of the cycle occurs when Wotan and Loge travel to the underworld. The beams of the machine, assisted by clever lighting, are arranged as a staircase – first vertical then tilting over to horizontal. This is the first of several instances where the singers are replaced by stunt doubles. The spectacle is great, but the dramatic effect of losing the connection with the actual performers is questionable at best. When confronted by Wotan and Loge, Alberich uses his brother’s magic helmet to transform himself into a terrifying serpent, displayed cleverly as a skeletal creature, then, in one of the very few laughs of the night, a cute little toad, which is easily captured by Loge. Another brave stunt by a singer comes when Wendy Bryn Harmer, as Fricka’s kidnapped sister Freia, is suspended on netting as she is covered with the gold the Gods have taken from Alberich. Her captors, the giants, are not happy until they have the ring, and the curse Alberich has placed on it is quickly seen when one giant kills the other for the ring. Coming at the end of such a long sitting, this death was disappointingly anti-climactic. Fafner just weakly hit Froh with a stick and that was it. The final image of the Gods travelling across the rainbow bridge to Valhalla looked absolutely beautiful but, again, the emotional connection was lost when the singers were all replaced by stunt doubles. Fair enough that the singers should not have to connect to cables and walk vertically up the set but losing the performers we have watched all night right at the point of climax robs the audience of savouring the moment with the actual cast. 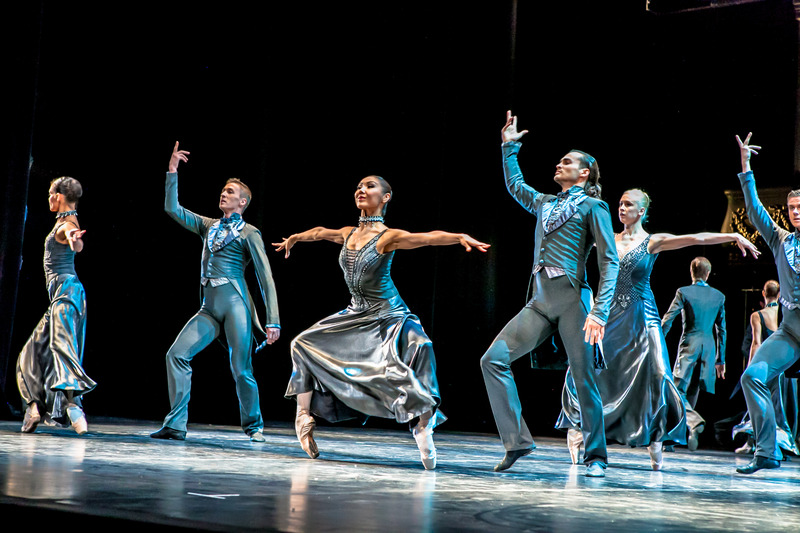 From the unabashed romance of act one to the thrilling, well known opening of act three to the heart-breaking ending, Die Walkure is a bit of an audience favourite in the cycle. But first, let’s pause for a moment to compare and contrast how the Met and the Royal Opera House handle superstar absences. I know the Met can email ticket buyers because I receive a reminder before each opera. In February this year, there were a couple of cancellations in operas I was seeing at ROH (Netrebko in La Traviata and Keenlyside in Macbeth) and I received very apologetic emails from ROH management in advance. I was able to return my La Traviata ticket and, after it was re-sold, I received my money back. I could have also made an exchange, which I would have done if I hadn’t already booked to see every possible production while I was there. Contrast this with the Met where tonight we found out by a slip of paper in the playbill that Jonas Kaufmann was not performing. The same thing happened on my second visit to La Traviata where Dessay cancelled. The Met has a no exchange/no refund policy, which means they can keep the ticket money when big stars cancel and, frankly, I find this unfair. The happy ending to the situation in this case at least is that Australian tenor Stuart Skelton (below) is an absolutely superb Siegmund. His singing with Eva-Marie Westbrook, Sieglinde, in the gloriously romantic act one is absolutely ravishing. The first of three stellar couplings on the night, this is followed by another incredible scene between Terfel and Blythe. The glorious singing, crisp diction and heartfelt expression of these stars is worth more than any number of millions spent on scenery. The third thrilling combination of the night involves Terfel again, this time with Deborah Voigt as the beloved Brünnhilde. Voigt’s first entrance captures the frisky, girlish verve of the warrior, and her singing and acting are wonderful throughout. 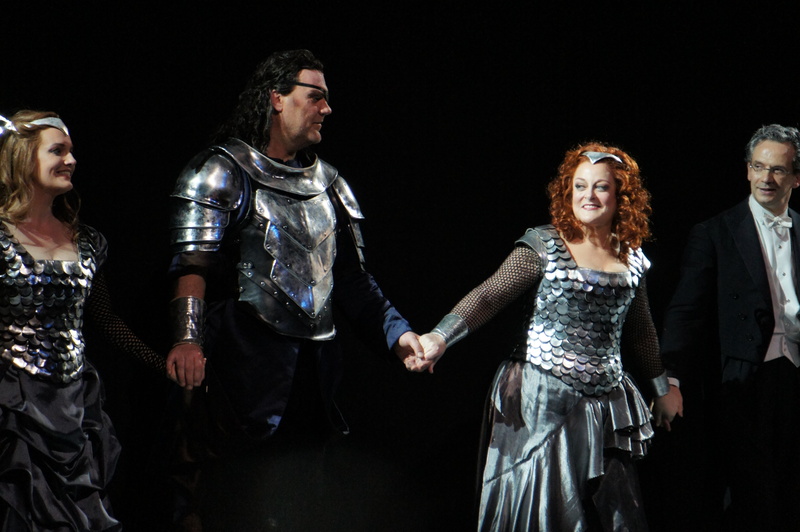 Brünnhilde’s silver costume matches Wotan’s gleaming armour, immediately communicating the strong link between father and daughter. The machine begins Die Walkure displaying a Snowy forest. The beams lift to create the wooden ceiling of a cabin with a venal vertical beam. An odd directorial choice for this act is that it takes place behind the front row of fixed beams, effectively ‘kneecapping’ the actors. Siegmund’s backstory is neatly enhanced by large animated silhouettes. Act two’s mountain setting see Fricka enter on a most imposing throne, complete with rams head arms. Curiously, the mountainside has an undercurrent of flowing lava and yet Wotan is able to walk on it. Brünnhilde’s sisters are glimpsed as the beams rotate from the mountainside to the forest where we find Siegmund and Sieglinde on the run her husband Hunding, Hans-Peter König. Brünnhilde’s compassion spares Siegmund but mighty Wotan enters and, in a brisk, exciting scene breaks Siegmund’s sword allowing Hunding to kill Siegmund. With a wave of his hand, Wotan dispatches Hunding, before ominously proclaiming that Brünnhilde will pay for defying him by sparing Siegmund. The Ride of the Valkyries, possibly the most well known piece of music from The Ring, is given a terrific treatment as the eight warrior sisters ‘ride’ the bucking beams as their horses. It is clear that these are the real performers in this case as each slides down their beam to dismount and begins to sing. 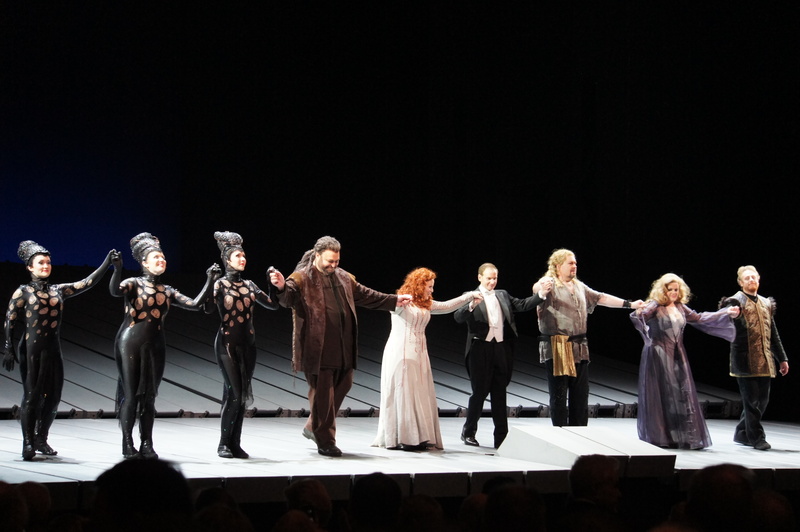 Terfel and Voigt are heartbreaking in this final act, but there is one last intrusion of the staging to come. After singing for forty minutes or so about leaving Brünnhilde sleeping in a ring of fire, the final, admittedly spectacular, scene is achieved with the use of a stunt double for Brünnhilde. A macabre vision sets the tone for the continued supernatural drama of Siegfried. A slithering forest floor, complete with beetles, rats and snakes, rotates into view, then continues to rotate to reveal Sieglinde in distress during the birth of Siegfried. Mime takes the baby and, in another brief scene, is seen raising him. The design features a water theme for this installment, with act one set in Mime’s cave in which a cascading stream flows into an underground brook. The other half of the cave houses Mime’s workshop where he tries, to no avail, to forge a suitable sword for his ward Siegfried. Siegfried repairs the sword of his father and, in a spectacular display of sparks, destroys Mime’s anvil. 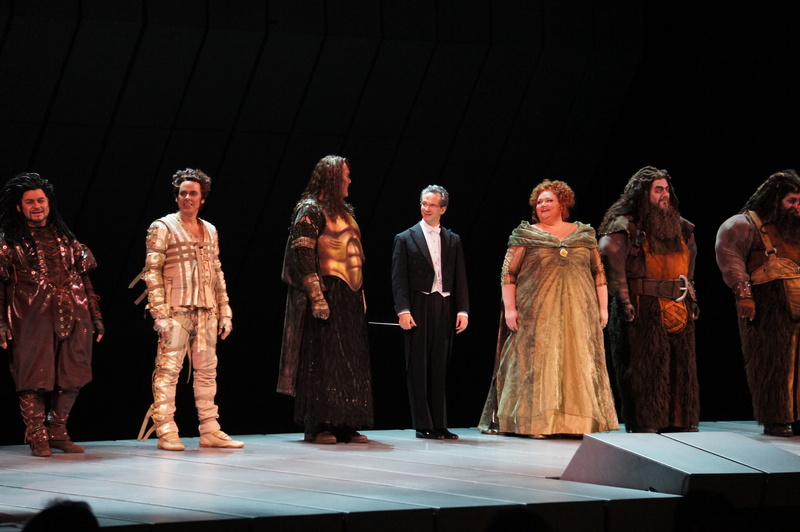 Stephen Gould sings the role of Siegfried capably but overall is no match for the dynamic flair and heroic magnetism that Jay Hunter Morris displayed in the role. This disappointment is compounded by the indisposition of Deborah Voigt on this evening. 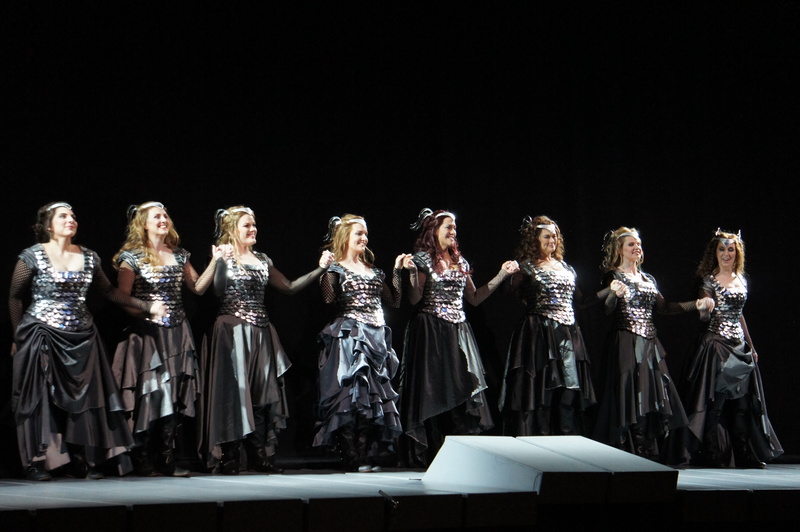 Brünnhilde, who only appears in act three, was sung by Katarina Dalayman. Bryan Terfel’s indomitable, highly focused, stringently disciplined performance as Wotan continues. Let’s just call him Lord of the Ring Cycle. The water theme appears in act two, with Fafner, now a mighty dragon, housed behind a cascading waterfall. The puppetry of Fafner is quite impressive, although it must be noted that he looks more like a giant snake or serpent than a dragon due to a complete lack of neck decoration. Erin Morley sings sweetly as the Forest Bird, which, in a neat touch, is seen flitting about well before it enters the story. 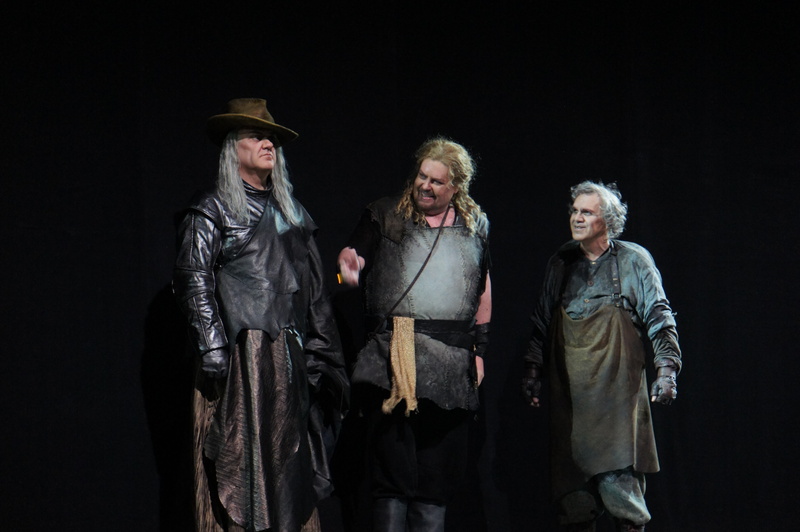 Events come full circle when Siegfried uses his sword to shatter Wotan’s spear. The subsequent music to which Siegfried discovers and rescues the sleeping Brünnhilde from within her ring of fire, is amongst the most beautiful in the entire cycle. Overall, this evening did not reach the performance heights of the previous performance of Die Walkure. The final stretch of this massive event begins with an extra long two hour act full of incident and intrigue. Containing four scenes, the act probably features more variety in the use of the machine than the other acts. As the cycle has progressed, it has become clear that one of the most significant uses of the beams and projections has been to create glorious visual images to accompany orchestral passages of introduction and transition. The visuals transport and prepare the audience, achieving more in this regard than could possibly be done with a simple set change. The rope of destiny is a tactile element in the opening scene, with the beams quite frightening in their weight and power as they swing wildly, tearing the rope. 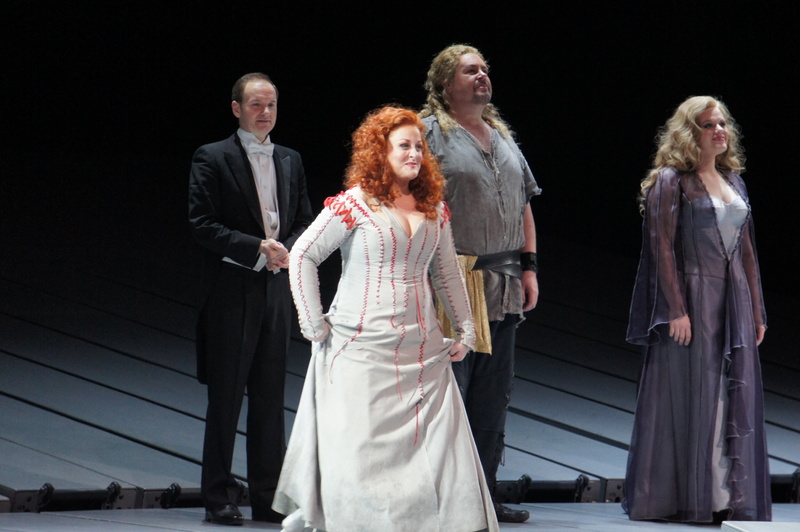 The protective fire surrounding Brünnhilde’s mountaintop continues to burn, providing a clear visual link through the three major operas of the cycle. Siegfried’s raft journey with Brünnhilde’s horse is impressively staged, with the armor-plated horse looking so life-like it could have come from next door at the Vivian Beaumont where War Horse is playing. The multitude of concentric golden circles provide a rich motif for the halls of the Gibichungs. Happily, Deborah Voigt (below) is back on board today, sounding wonderful and looking every inch the loving, and beloved, warrior princess. With a journey through love, fear, anger, betrayal, retribution and devastation, Götterdämmerung provides the opportunity for a tour de force for Brünnhilde. 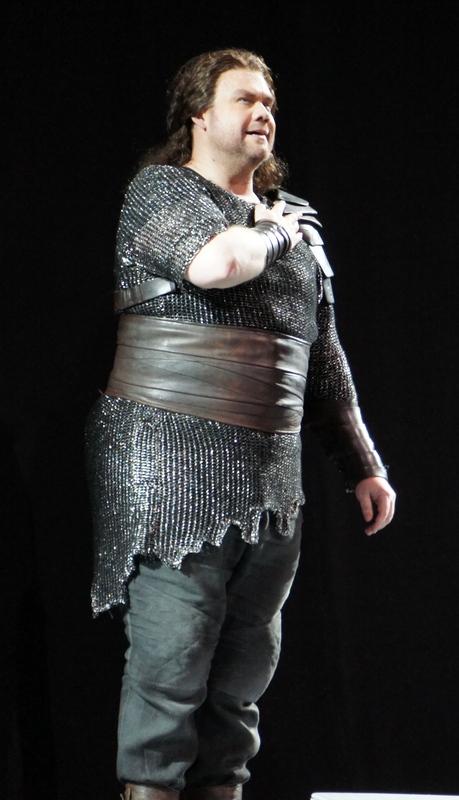 Voigt shows herself to be well and truly up to the challenge, acting with focus and stamina, revealing all of Brünnhilde’s complexity through a brilliantly underplayed, emotional performance. All of the singers, it is pleasing to note, sound wonderful and must be remarkably well warmed up given the early start today. 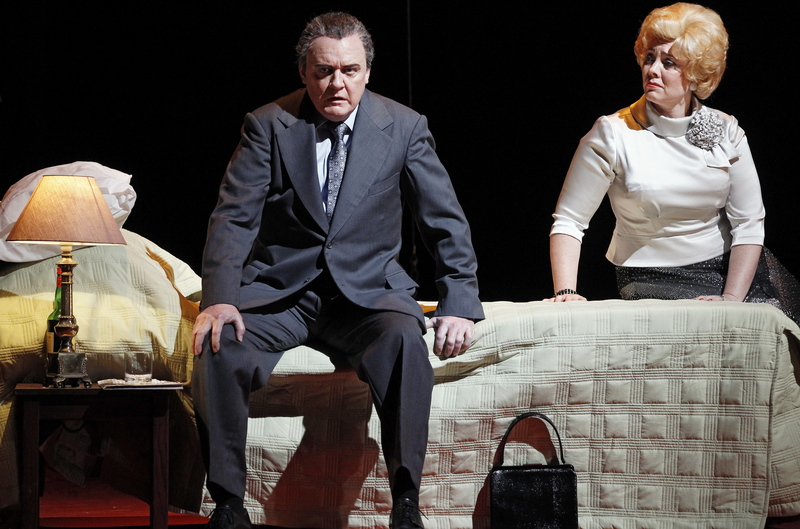 The rich, warm bass of Hans-Peter König, as Hagen, is a highlight. Stephen Gould, still not suited to the character and appearance of the heroic Siegfried in my view, has come to these performances in extremely fine voice. His tireless, highly expressive singing throughout act three was an absolute highlight of this opera. 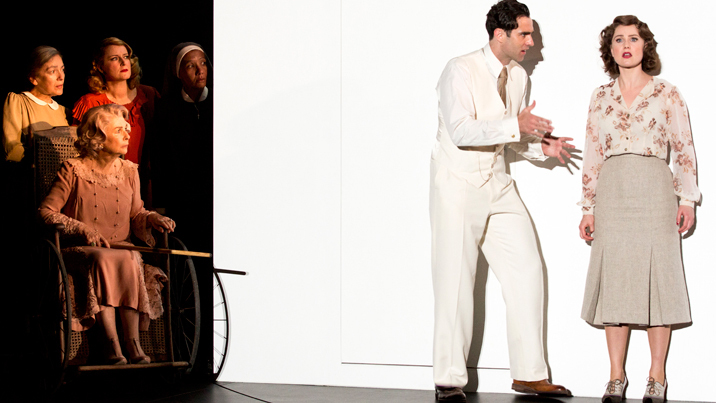 Act two provides extra vocal interest with the cycle’s only massed ensemble scenes. 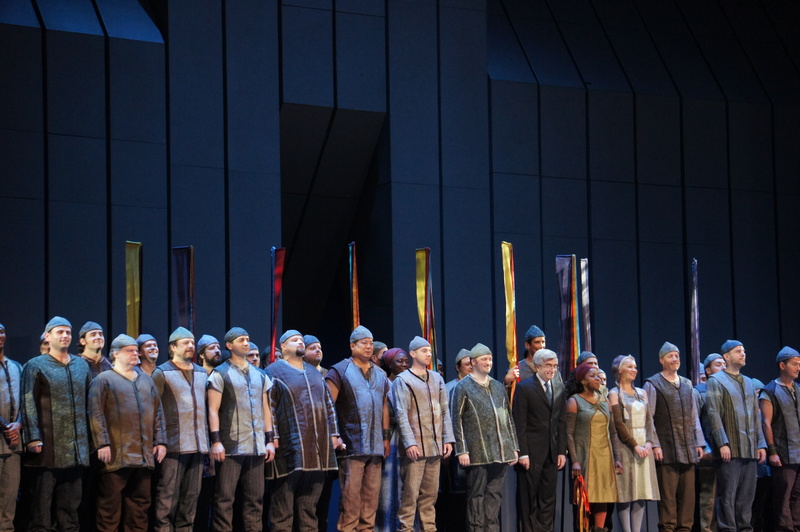 The Metropolitan Opera Chorus are reliably strong, with solid acting complementing their excellent singing. Congratulations to Joseph Palumbo for his exacting preparation of the Chorus. In act three, the story begins to return to where it started with the appearance of the frolicsome Rhinemaidens, who alternately sit on rocks and then slide down their waterfall. While the final drama of the story is given full weight and impact, the final moments of destruction in the opera are a somewhat lame affair given the terrific effects that have been seen along the way. The Met’s Ring Cycle has introduced me, and countless others around the world, in cinemas, to Wagner’s master work. The quality of the singers has been consistently high and their tremendous acting skills have also served to bring the story and its characters to full life. Francois St-Aubin’s creative costumes have been sumptuous, and have been integral in defining the characters. A final word about the quality of the undertaking must go to the musicians. The standard of playing by the Metropolitan Opera Orchestra has been nothing short of miraculous. The dedication of these musicians in learning so much music and for sitting in the pit for such long stretches is extraordinary. Cycle III was conducted by Fabio Luisi, Derrick Inouye and John Keenan. Congratulations one and all. – In Die Walkure cycle I, the projection went off for a short time. When it resumed, the audience gasped at the huge Microsoft Windows logo projected onto the machine. – In Götterdämmerung cycle I, Siegfried entered wearing the Tarnhelm covering his face as Brunnhilde is meant to believe it is Gunther. Siegfried’s face was clearly shown, however, when the Tarnhelm fell off. – In Götterdämmerung cycle III, the Rhinemaidens were haranguing Siegfried to return the ring. He waved his hand at them and the ring went flying off his hand across the set. Do you take notes during the performance because I don’t know how you remember all that. And I stayed awake for probably 90% of it. What exactly is a “Ring Cycle” anyway ? Does it mean seeing all four at any time, or all four during one week or or all four of the same production regardless of when or all four of the same production in the same season ? I saw Cycle 1: Rheingold, Valkeries and Twilight. I then saw Cycle 2 Siegfried. Did I see a “Ring Cycle” or not ? Curious as to what exactly it refers to. I guess doing a Ring Cycle means going to see all four in a row. I thought the Met were only selling tickets as sets of four. You must have bought individual tickets. Hopefully for you, buying individual tickets meant you avoided the very high ‘contribution’ fee! 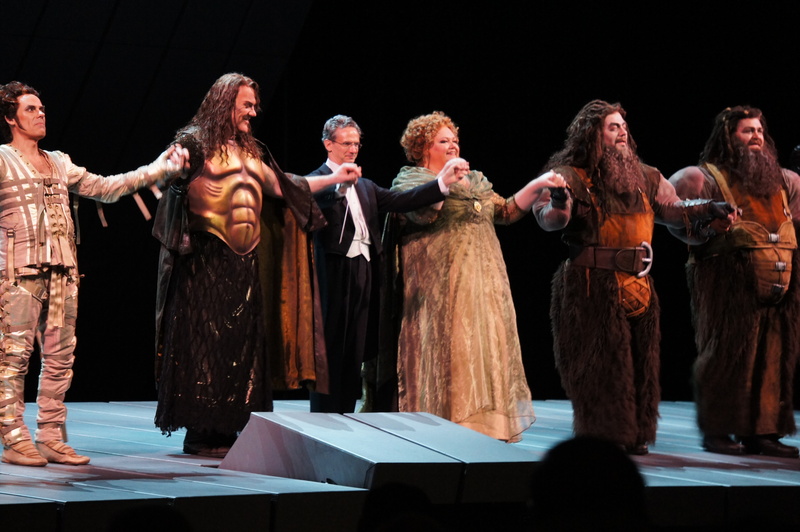 The way the Met introduced the four Ring operas one at a time over two years was quite unusual. Usually around the world the four aree done together. We are having this in Melbourne, Australia next year! And yes, I took notes in the Ring operas – I took my iPad and worked on the ongoing review during each interval. Plus I saw the whole cycle twice!! Enjoy ABT. Hopefully in will be back in NY before long. In the meantime I guess I will have to make do with the HD telecasts.. I couldn’t attend #1 Sigfried (from whence I take my nom de plume) so I had to acquire a ticket for Sigfried alone. I’m reviewing an opera in Melbourne the day I get back so look out for that. Thanks for all your feedback over the past few weeks! Your welcome. I will try to keep up with your blog so I can learn a thing or two about opera. PS, ABT opening night gala was very impressive.. If you like dance. Actually, even if you don’t.